great breakfast and friendly front-desk staff. good price for the location. room is comfortable. very easy for family. Ski location couldn’t be better. Location, breakfast when there were ladies among staff arranging. One morning only guys and it was a mess. Price quality: perfect! Nice sauna and jacuzzi, close to ski lifts. Shuttle from the village parking. Close to the main street and ski lifts. Comfortable bed. Excellent location for access to the ski slopes and the village restaurants, bars and shops. Rooms clean and comfortable - cleaners came in every day. Both rooms had a balcony, the Superior Double with views of the mountains and was very sunny. Good boot room for skis and boots - direct access out to the main street. Buffet style breakfast with plenty of choice and no restrictions. Wellness facilities clean and well maintained. Berghof Garni - The Dom Collection This rating is a reflection of how the property compares to the industry standard when it comes to price, facilities and services available. It's based on a self-evaluation by the property. Use this rating to help choose your stay! These include a sauna, a steam bath, a whirlpool, an infa-red cabin, a solarium and fitness facilities. Within a few minutes' walk you can reach the center of Saas-Fee. Transfers to and from the airport and the train station are available on request. Upon arrival, guests will receive a pass providing the following benefits: During Summer (June to October), public transport and the cable cars in the Saas Valley (except the Metro Alpin) can be used free of charge (not valid for summer skiing). In Winter (November to April), public transport is free and discounts are offered for several activities. 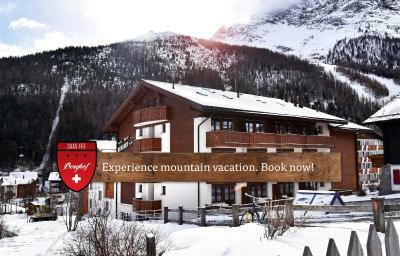 뀐 Located in the top-rated area in Saas-Fee, this property has an excellent location score of 9.2! When would you like to stay at Berghof Garni - The Dom Collection? House Rules Berghof Garni - The Dom Collection takes special requests – add in the next step! Berghof Garni - The Dom Collection accepts these cards and reserves the right to temporarily hold an amount prior to arrival. Could be a bit more clean in the room. First, This is NOT in Zermatt. The room is smaller than the picture. The heater did not work the first night, and there are no staff to ask to fix it until the morning. Temperatures were below freezing outside and inside was Not comfortable. The view shown in the pictures is also not real, this place is in between other buildings. We understand that the Dom Collection are running this hotel temporarily due to illness. This meant that there was limited staffing in the hotel, generally in the mornings when breakfast was being served and the cleaners were in. There was a number on reception to call if any queries. There is no bar or restaurant, despite it being indicated on several websites. Hot tub/ jacuzzi cold, bar not open needed bar/lounge to have a drink after skiing/pre dressing. Need a good clean. Pillows inside cases filthy with hair and fuzz. No proper WiFi, simple request for lactose free milk ignored, very simple breakfast with daily cold scrambled eggs and sausages, dirty ski room, lobby closed and no possibility to order coffee or wine. Location, more or less right at the slopes. Dining out is expensive in Saas-Fee and some tourists may prefer half pension which is considerably cheaper. A Bed & Breakfast obviously cannot offer this. Perfect Bed & Breakfast. Comfortable rooms, decent spa, very friendly and welcoming staff, good breakfast, great location close to the lifts, free transport from the parking. Competitive pricing. I hope none of this will change in the future. A bit expensive for such an old style hotel. Bar was closed down, access to hotel hall closed off after 21h, wet sauna not working, toilet seat falling off. Kids had a double bed, which of course led to fights. The only good thing about the hotel is its proximity to the ski lifts. The hotel is bit run down. There is no functioning bar, the chimney does not work anymore, the walls in the rooms are quite thin so you can hear the people from the neighboring rooms quite well. The breakfast could be slightly better, the scrambled eggs were always cold. The selection of other things or breakfast was reasonable. The hotel is located in a good location in Saas-Fee close to the ski slopes. You get the transfer from the parking to the hotel quite rapidly. There is jacuzzi in the hotel and the sauna. There is also convenient access from the ski room to the main street.